Construction may impact how you travel. See section below for traffic advisory information. The Scudder Falls Bridge Replacement Project is being staged in a manner that will minimize impacts to traffic, local business and communities. Various measure will be used to manage construction impacts. All major construction activities will be evaluated for their impacts on traffic to ensure construction is sequenced in a manner that imposes the lowest feasible impact on the traveling public. While traffic shifts and mid-day/overnight lane closures are necessary to complete the work, all existing lanes will remain open during morning and evening commuting times, and all ramp detours will be temporary and short-term in duration. See below for the list of traffic advisories for the upcoming week. 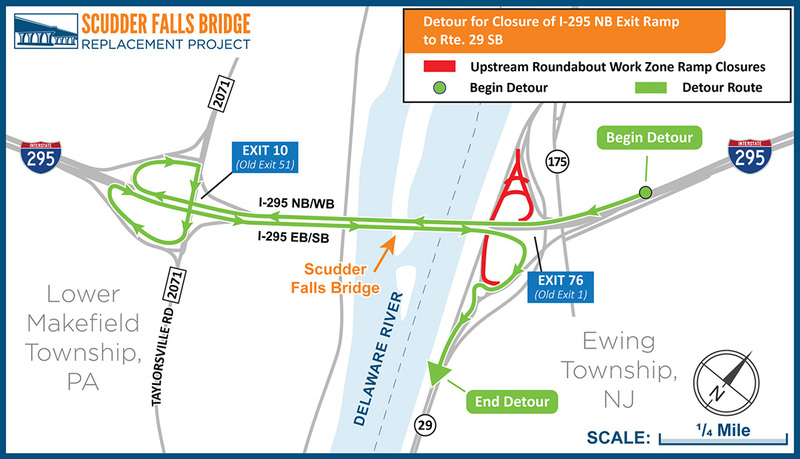 I-295 NB/WB (old I-95 SB) approaching the Scudder Falls Bridge Pennsylvania-bound – Single-lane travel patterns possible 7 p.m. to 2 p.m. (next day) Monday, April 22, through Friday, April 26. Note: Within these time periods, single-lane travel is possible on the Scudder Falls Bridge for concrete deliveries 1 a.m. to noon Tuesday, April 23 to Friday, April 26 (weather sensitive). I-295 EB/SB (old I-95 NB) crossing the Scudder Falls Bridge into New Jersey – Intermittent single-lane travel patterns noon to 4 p.m. and 6:30 p.m. to 6 a.m. (next day) on Monday, April 22, and 10 a.m. to 4 p.m. and 6:30 p.m. to 6 a.m. Tuesday, April 23, through Friday, April 26. Route 29 NB bypass roadway – Intermittent short-duration, flagger-controlled stoppages noon to 5 p.m. Monday, April 22, and 7 a.m. to 5 p.m. Tuesday, April 23, to Friday, April 26. Route 175/River Road – Intermittent alternating single-lane travel patterns noon to 6 p.m. Monday, April 22, and 6 a.m. to 6 p.m. Tuesday, April 23 to Friday, April 26. 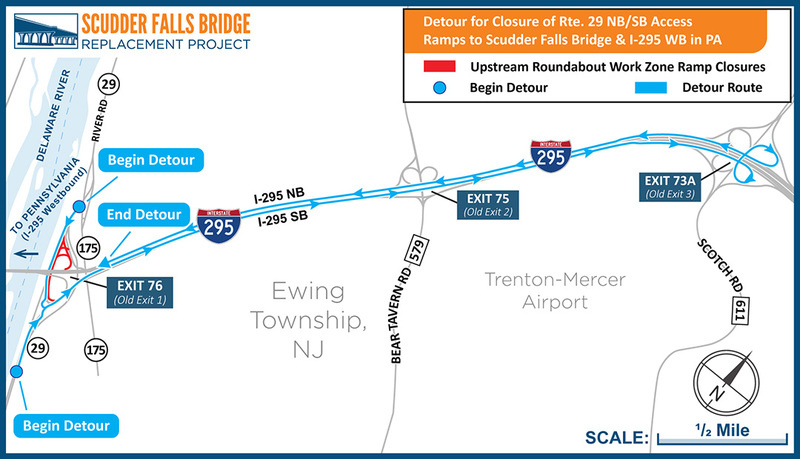 I-295 EB & WB in the vicinity of the Scudder Falls Bridge – Off-peak single-lane travel patterns possible due to construction/demolition along I-295 on the NJ side of the Scudder Falls Bridge Monday, April 22, to Friday, April 26. Note: Concrete deliveries likely on the bridge in the PA-bound direction during the mornings of Tuesday, April 23, to Friday, April 26. Taylorsville Road north of I-295 – Intermittent single-lane patterns with possible flagger-controlled travel noon to 4 p.m. Monday, April 22, and 9 a.m. to 4 p.m. Tuesday, April 23, to Friday, April 26. Taylorsville Road south of I-295 – Intermittent single-lane patterns with possible flagger-controlled travel noon to 6 p.m. Monday, April 22, and 9 a.m. to 6 p.m. Tuesday, April 23, to Friday, April 26. Woodside Road – Intermittent right or left lane closures with passage maintained in each direction and/or flagging-controlled travel noon to 6 p.m. Monday, April 22, and 10 a.m. to 6 p.m. Tuesday, April 23, to Friday, April 26. 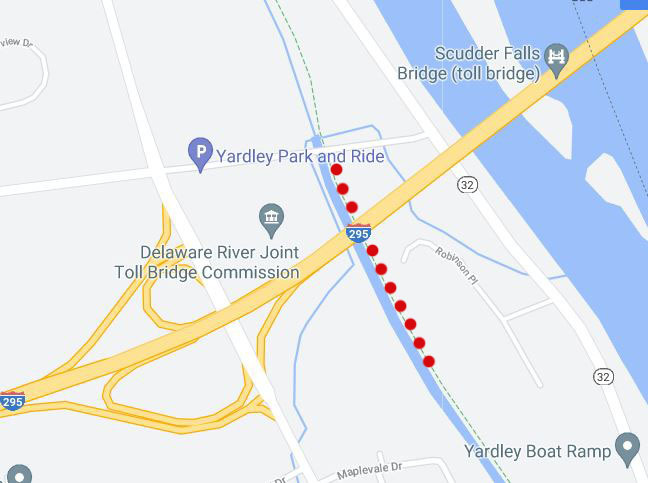 PA Route 32/River Road – Intermittent alternating traffic controlled by flaggers noon to 5 p.m. Monday, April 22, and 7 a.m. to 5 p.m. Tuesday, April 23, to Friday, April 269. Easter weekend: Any Friday overnight travel restrictions must be lifted by 6 a.m. Saturday, April 20. 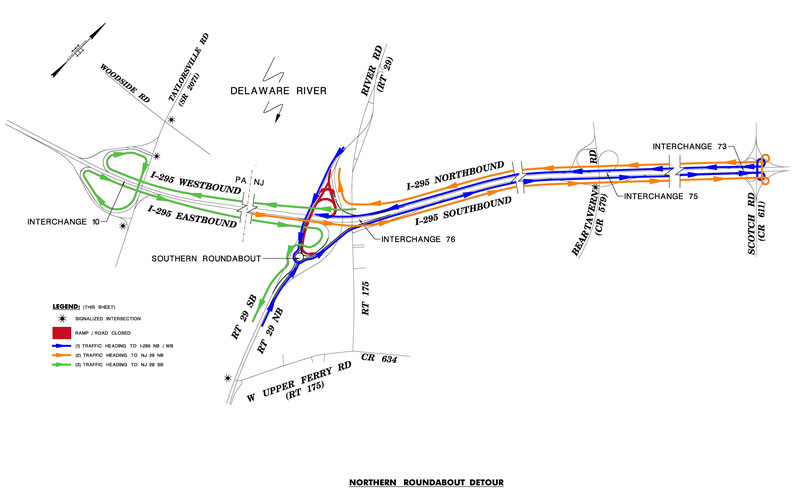 A moratorium on lane closures will then continue until noon Monday, April 22. 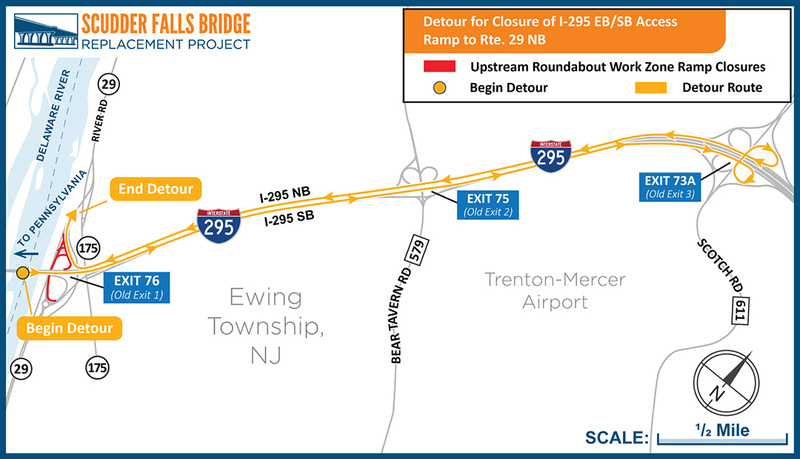 The uninterrupted 24/7 ramp closures on the upstream side of the I-295/Route 29 interchange will continue through the weekend and are not expected to be lifted until late June. 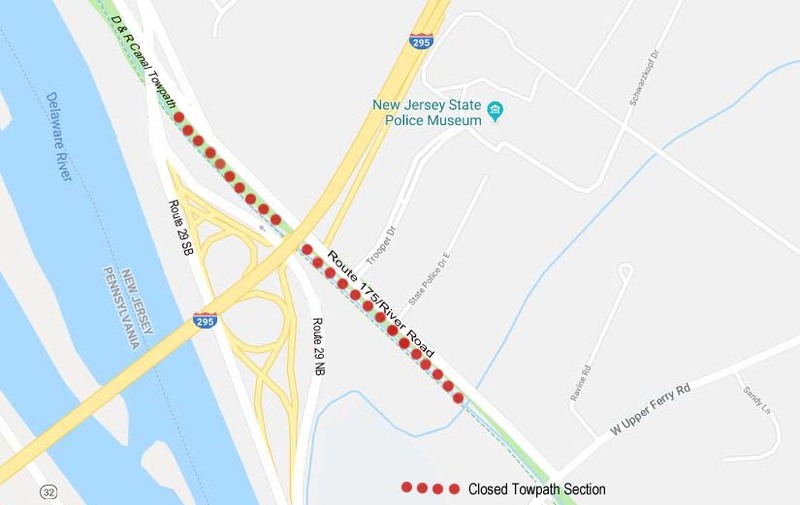 NJ side –Intermittent daytime and nighttime closures of the Delaware & Raritan Canal towpath segment in New Jersey are extended through April.